Quilt Designs by Glenda Sha! Welcome to the virtual home of Liberty Homestead. Quilters who have visited my booth at national quilt shows or here at our new shop, Liberty Homestead Mercantile, often remark “I just want to live here!” This is exactly the feeling I’m going for in all my quilts, and I’m happy to bring my Quilt Patterns, designs and fabrics to you at your house. In my series of quilt books, Liberty Homestead Quilts, I’ve concentrated on what I call “down home quilting”. These are back to basics, traditional quilts with a little bit of “pretty” thrown in, and feature our own line of Hand Dyed, SUEDED Cottons. While I am a big fan of fine hand quilting, many of my quilts are finished with a running utility stitch that was very prominent in the good old country “made to be used” quilts. 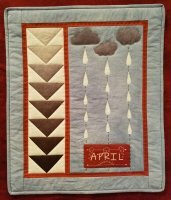 My style of quilting reminisces about a simpler time and place, and hopefully brings those “old timey” feelings into our very modern world. 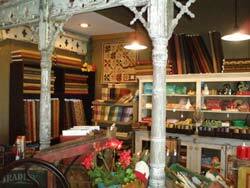 I started Liberty Homestead in 1979 and have been designing quilts and publishing quilt books ever since. 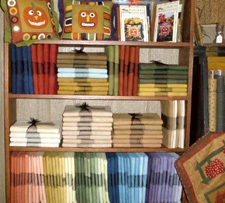 Mainly I work with traditional quilt patterns and folk art themes, using a variety of solids, prints, and plaid fabrics including cottons, flannels, and wool. I prefer working with smaller quilts like wall quilts, banners and throws, but every now and then I’ll throw in a pattern for a bed-size project. To add additional interest, I like to combine traditional quilt piecing with unusual additions like wool applique and hand embroidery. One of the main ingredients in a successful quilt, and the best way to bring that “down home” feeling into your work is through the fabric. Liberty Homestead’s Hand Dyed, Sueded Cotton is a perfect fit for both. Almost all of the quilts shown in the Patterns and Libery Homestead Quilt Books use this fabric for the backgrounds and all the solid colors. 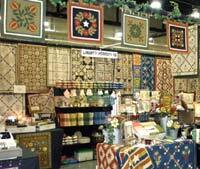 Many of you may be familiar with Liberty Homestead Books and Patterns from seeing our booth at the many quilt shows all across the country. Check out our current show schedule to see where we’ll be exhibiting next. I’ve enjoyed meeting and talking with quilters from coast to coast. I love hearing about all your projects and watching how you put my fabrics together with endless color combinations. I also love it when you bring pictures of quilts you’ve made from one of my books, and I keep these in our album we take to shows. I’m now starting a new page on the web site where I can post those pictures of your finished quilts for everyone to see! So check out our show schedule, and keep those cards and letters coming!